Christmas, minus-degree temperatures and the third pilot season of the CLIPS project are coming closer. Winter’s pilot season begins in December and the autumn’s forecasts will change into brand new six week forecasts. Pilot users will receive an e-mail notification when the winter’s forecasts products are launched. We will tell more about the winter’s six week forecasts when the pilot season changes. Some of the winter six week forecasts are brand new and others are updated version of the autumn’s forecast products. For example, the outlook for driving conditions is a modified version of the winter tire outlook, better suited to estimate the winter conditions on the roads. Storm outlook includes the same air pressure forecast as during the autumn but will also feature new ones that estimate the strength of wind gusts and the risk of strong wind gusts on a weekly level. Sweather weather outlook is a brand new six week forecast that brings mittens and winter boots on the weather charts. It estimates, based on the joint effect of temperature and wind speed, whether the weather conditions on the upcoming six weeks are mild, chill or freezing. What was the piloting of the six week forecasts all about? The CLIPS project invites the Finnish public to take part in the co-creation and piloting of the new services. Anyone can join in to test the six week forecasts or share their ideas about them. Piloting phase of CLIPS project’s six week forecasts continues for a year. Piloting is divided into four periods based on the seasons: summer, autumn, winter and spring. 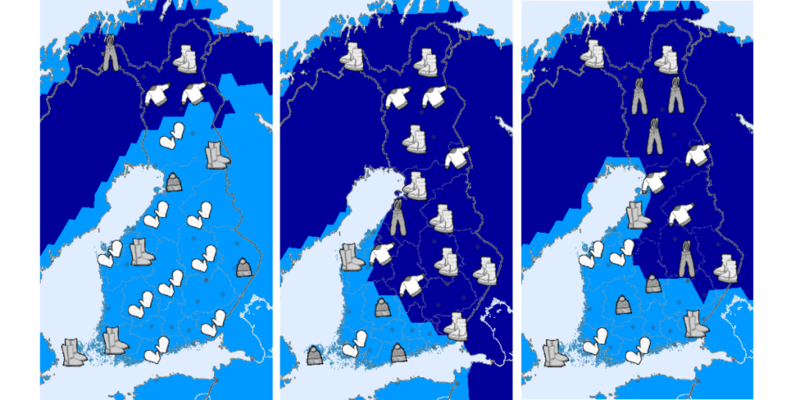 The available six week forecasts vary between the seasons. New pilot users are welcomed throughout the project, sign up for piloting (six week forecasts are only launched in Finnish so far). Content is unfortunately only available in Finnish at the moment.